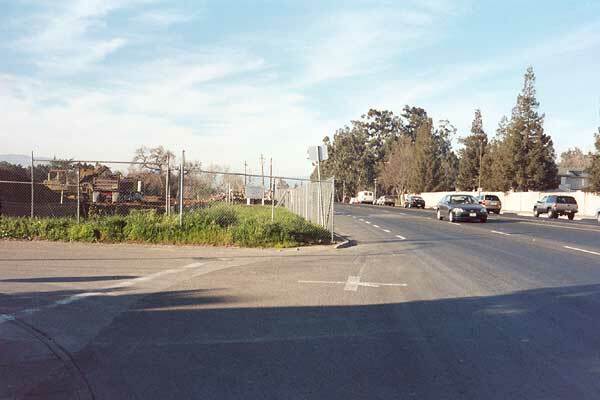 Most street corners on San José's Tully Road have been designed with big, wide corner radii, so that traffic doesn't have to slow down too much while turning. Not coincidentally, several intersections along Tully Road are listed among the city's most dangerous for pedestrians getting hit. This has been known for years, but nothing of substance has been done about it. One rare exception is the intersection of Tully and Kenoga, where the corner is tight enough that traffic actually does have to slow down before turning. However, Tully Road is being widened, and this tight corner will be rebuilt shortly. When street corners are rebuilt in San José, they are often widened to be rounder and more friendly to speeders. Kenoga residents will likely notice more speeding on their street after the rebuilding of the corner. As well, pedestrians crossing here to get to the new library will need to be more careful at this intersection than they do now. Because cars come first in San José. It's policy. Kenoga Drive heads south (left) from busy Tully Road. Note the absence of a sidewalk alongside the chain-link fence.